Why Convert FLV to iPhone 4 on Your Mac? If you are one of notable users of Flash Video format (FLV for short) from YouTube, Hulu, Google Video, Yahoo! Video, Metacafe, Reuters.com, Myspace, for more flexible sharing and enjoying, you may need to convert and transfer FLV video file to MPEG 4 for playing and watching FLV on iPhone 4. And this FLV to iPhone 4 conversion is supposed to be processed on your Mac OS X Tiger, Leopard or Snow Leopard. Is It Possible to Play and Watch FLV Video on iPhone 4 ? The answer is absolutely yes! Since it must be a fairly delightful experience to play and watch FLV videos downloaded from Video sharing website, like YouTube FLV Video, you may be also eager to putting FLV videos onto iPhone 4 for Mac. However, owning to iPhone 4 supported video file types are limited within few formats, you'd better convert FLV video to MPEG 4, which is iPhone 4, iPad and iPod most preferred video format. In advance, you should get a well FLV to iPhone 4 Converter for Mac prepared. 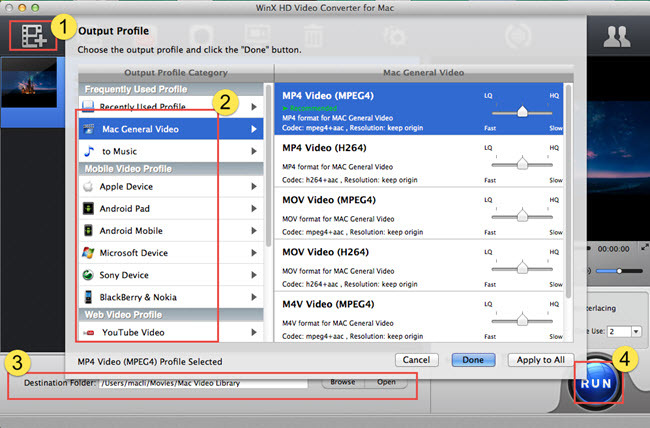 WinX HD Video Converter for Mac is the one you chosen right. Build-in more than 370 video and audio codec, this versatile can not only convert FLV to MPEG4 for iPhone 4/5/6 Mac, but also support converting AVI, MOV, MKV, MPEG, WMV, M2TS, TS, AVCHD to iPhone, iPad, iPod and Apple TV. And equipped with Hyper Threading Technology, this FLV to iPhone 4 converter for Mac offers you up to 83x real time converting speed. Most important thing that makes this HD Video Converter for Mac outstanding is its favorable stability upon Mac OS. Based on the numerous senior software developers and reviewers' tests, this FLV to iPhone converter for Mac is borne out to a stable application under Mac OS X Mountain Lion/Mavericks/Yosemite. How to use this FLV to iPhone Converter for Mac OS X? Dedicatedly designed by Digiarty Software, this FLV to iPhone Converter for Mac is available for free download and 5 minutes trial time. With tiny file size, this FLV to iPhone 4/5/6 converting software will definitely cost few time to get it downloaded and launched. Step One: select the target FLV video. Click Add Video button to load your FLV videos. This all-in-one video converting solution for Mac encompasses almost all the popular video formats. Or, you can also import the Website FLV video directly by clicking Add URL (surprisingly this HD Video Converter for Mac is a Website Video Downloader as well). In the file list window, all the FLV video information will indicate specifically, like the FLV Clip Name, Clip Information, Duration, Output details, etc. Step Two: preset the settings for FLV to iPhone 4 video conversion. 1. This FLV to iPhone 4 video converter for Mac offers variety options, such as convert FLV to general Mac video formats, convert FLV to HD videos, convert FLV to Apple devices, convert FLV to DVD VOB format, convert FLV to Sony console players, to portable devices and MP3 Music format. Here just select one iPhone model under "Apple Device" category, like iPhone 6, Plus (MPEG 4). 2. Set the Output Folder by clicking Browse button. 3. Right click RUN table to get FLV to MPEG4 video converting process started. This FLV to iPhone 4/5/6 Video Converter for Mac is especially designed for Mac OS X Snow Leopard/Lion/Mountain Lion/Mavericks/Yosemite/El Capitan. And at the same time, you can also convert FLV video onto portable devices and console players, like convert FLV to iPad, transfer FLV to iPhone 6 Plus, convert FLV to iPod, extract Music MP3 from FLV to iPod, PSP, etc. Mac OS DVD ripping solution. Backup DVD to Mac hard drive within few minutes. Convert and transfer latest DVDs to iPad, iPhone 4G, iPod, PSP, etc. Runs perfectly on Mac OS X Snow Leopard/Lion/Mountain Lion/Mavericks/Yosemite. Windows version HD Video Converter for Mac. Builds in 160 video codec and 50 audio codec, a perfect multi-functional combination of HD Video Converter, DVD Burner and Website Video Downloader. Supports Multi-track HD video M2TS, MKV, AVCHD, HDTV BDAV and MPEG-TS video movies. "I've tried and bought your WinX DVD Ripper for Mac. It runs perfectly on my Mac OS X Snow Leopard. And I'm deeply impressed by its first class performance and features. The ripping speed is very fast, I am very happy to be able to use this excellent program. As always, I'm glad to share a good words with my friends."